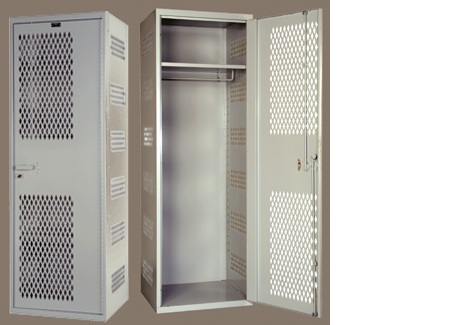 [XPB-HTXX22AS] Our All Welded High Security Metal Lockers are all-welded construction, 16 gauge heavy-duty body and 18 gauge back, sides formed to be integral with front vertical frame and are reinforced using two front-to-back channel stiffeners welded to the underside . They are one tier, one wide and are available in solid or ventilated versions. These lockers come in Platinum Powdercoat color. For pricing, shipping quotes, orders or questions please call our Customer Service Center at 1-877-483-9270.